Common Problem: CD Changer does not eject nor accept discs, Intermittent wont change disc, skips, control panel does not function at all, no power up. Air Condition stuck in one position and can not change the fan setting. Repair Cost: $150. to $295. Note: If your CD Changer functions properly, please remove all of your discs from the changer before shipping it for repair. Common Problem: CD's Jammed, CD error, won't load CD, no eject, no function. Air Condition control panel not responding. A/C blower stuck in position and can not be changed. Common Problem: CD's Jammed, CD error, won't load CD, no eject, no function. Air Condition control panel not responding. A/C blower stuck in one position and can not be changed. Navigation Screen does not open, retract, black screen. Wont accept navigation disc. Repair Cost: $150. to $425. Note:If your CD Changer functions properly, please remove all of your discs from the changer before shipping it for repair. 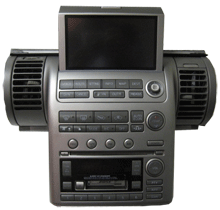 Your radio system is equipped with state of-the-art electronic circuits to enhance radio reception. These circuits are designed to extend reception range, and to enhance the quality of that reception. However there are some general characteristics of FM, AM and satellite radio signals that can affect radio reception quality in a moving vehicle, even when the finest equipment is used. These characteristics are completely normal in a given reception area, and do not indicate any malfunction in your radio system. Remember that a moving vehicle is not the ideal place to listen to a radio. Because of the movement, reception conditions will constantly change. Buildings, terrain, signal distance and interference from other vehicles can work against ideal reception. Described below are some of the factors that can affect your radio reception. FM range is normally limited to 25 to 30 miles (40 to 48 km), with monaural (single channel) FM having slightly more range than stereo FM. External influences may sometimes interfere with FM station reception even if the FM station is within 25 miles (40 km). The strength of the FM signal is directly related to the distance between the transmitter and receiver. FM signals follow a line-of-sight path, exhibiting many of the same characteristics as light. For example they will reflect off objects. As your vehicle moves away from a station transmitter, the signals will tend to fade and/or drift. During signal interference from buildings, large hills or due to antenna position, usually in conjunction with increased distance from the station transmitter, static or flutter can be heard. This can be reduced by adjusting the treble control counterclockwise to reduce treble response. Multi-path reception: Because of the reflective characteristics of FM signals, direct and reflected signals reach the receiver at the same time. The signals may cancel each other, resulting in momentary flutter or loss of sound. AM signals, because of their low frequency, can bend around objects and skip along the ground. In addition, the signals can be bounced off the ionosphere and bent back to earth. Because of these characteristics. AM signals are also subject to interference as they travel from transmitter to receiver. Fading: Occurs while the vehicle is passing through freeway underpasses or in areas with many tall buildings. It can also occur for several seconds during ionospheric turbulence even in areas where no obstacles exist. Caused by thunderstorms, electrical power lines, electric signs and even traffic lights. When the satellite radio is first installed or the battery has been replaced, the satellite radio may not work properly. This is not a malfunction. Wait more than 10 minutes with satellite radio ON for satellite radio to receive all of the necessary data. 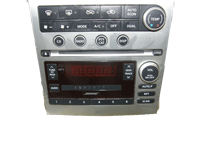 No satellite radio reception is available unless optional satellite receiver and antenna are installed and an XM or SIRIUS satellite radio service subscription is active. Satellite radio is not available in Alaska, Hawaii and Guam.Satellite radio performance may be affected if cargo carried on the roof blocks the satellite radio signal. Do not force a compact disc into the CD insert slot. This could damage the CD and/or CD changer/player. Trying to load a CD with the CD door closed could damage the CD and/or CD changer. During cold weather or rainy days, the player may malfunction due to the humidity. If this occurs, remove the CD and dehumidify or ventilate the player completely. 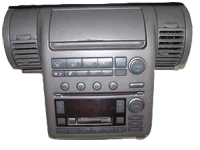 The CD player sometimes cannot function when the passenger compartment temperature is extremely high. Decrease the temperature before use. Do not force a compact disc into the CD insert slot. This could damage the CD and/or CD changer/player. Only use high quality 4.7 in (12 cm) round discs that have the COMPACT™ disc DIGITAL AUDIO™ logo on the disc or packaging. CDs that are of poor quality, dirty, scratched, covered with fingerprints, or that have pin holes may not work properly. Do not use the following CDs as they may cause the CD player to malfunction. CDs with MP3 or WMA format cannot be written in this audio system. Confirm that the CD is inserted correctly (the label side is facing up, etc.). Confirm that the CD is not bent or warped and it is free of scratches. This is a malfunction due to excessive temperature inside the player. Remove the CD by pushing the EJECT button. After a short time, reinsert the CD. The CD can be played when the temperature of the player returns to normal. MP3 is short for Moving Pictures Experts Group Audio Layer 3. MP3 is the most well-known compressed digital audio file format. This format allows for near CD quality sound, but at a fraction of the size of normal audio files. MP3 conversion of an audio track from CD-ROM can reduce the file size by approximately a 10:1 ratio with virtually no perceptible loss in quality. MP3 compression removes the redundant and irrelevant parts of a sound signal that the human ear doesn't hear. Windows Media Audio (WMA) is a compressed audio format created by Microsoft as an alternative to MP3. The WMA codec offers greater file compression than the MP3 codec, enabling storage of more digital audio tracks in the same amount of space when compared to MP3s at the same level of quality. Bit rate denotes the number of bits per second used by a digital music file. The size and quality of a compressed digital audio file is determined by the bit rate used when encoding the file. Sampling frequency is the rate at which the samples of a signal are converted from analog to digital (A/D conversion) per second. Multi-session is one of the methods for writing data to media. Writing data once to the media is called a single session, and writing more than once is called a multi-session. The ID3/WMA tag is the part of the encoded MP3 or WMA file that contains information about the digital music file such as song title, artist, album title, encoding bit rate, track time duration, etc. ID3 tag information is displayed on the Album/Artist/Track title line on the display. * Windows and Windows Media are either registered trademarks or trademarks of Microsoft Corporation in the United States and/or other countries. The names of folders not containing MP3/WMA files are not shown in the display. If there is a file in the top level of the disc, ROOT is displayed. The playback order is the order in which the files were written by the writing software. Therefore, the files might not play in the desired order. Check if the disc was inserted correctly. Check if the disc is scratched or dirty. Check if there is condensation inside the player. If there is, wait until the condensation is gone (about 1 hour) before using the player. If there is a temperature increase error, the CD player will play correctly after it returns to the normal temperature. If there is a mixture of music CD files (CD-DA data) and MP3/WMA files on a CD, only the music CD files (CD-DA data) will be played. Files with extensions other than .MP3, .WMA, .mp3 or .wma cannot be played. In addition, the character codes and number of characters for folder names and file names should be in compliance with the specifications. The bit rate may be too low. It takes a relatively long time before the music starts playing. If there are many folder or file levels on the MP3/WMA disc, or if it is a multi-session disc, some time may be required before the music starts playing. The writing software and hardware combination might not match, or the writing speed, writing depth, writing width, etc., might not match the specifications. Try using the slowest writing speed. Skipping with high bit rate files Skipping may occur with large quantities of data, such as for high bit rate data. Move immediately to the next song when playing. When a non-MP3/WMA file has been given an extension of .MP3, .WMA, .mp3 or .wma, or when play is prohibited by copyright protection, there will be approximately 5 seconds of no sound and then the player will skip to the next song. The playback order is the order in which the files were written by the writing software. Therefore, the files might not play in the desired order.